* Jonah Usman (born 10.10.1993) of ABS FC is the first choice goalkeeper for the Flying Eagles, the Nigeria U-20 national football team. When he returns to Ilorin after the 2013 African U-20 Championship, Usman could struggle to win back the number one shirt at his club. David Walbe, formerly of Abia Warriors FC, has performed brilliantly in Usman’s absence. * After a successful period in the Republic of Niger, playing for Niamey-based AS FAN, expectations were high when Ivorian striker Boris Konan joined Nigerian football before the 2012-season. Konan featured for both Rangers International FC and Dolphins FC during the Nigeria Premier League 2012. Unfortunately, his finishing was rather poor. Konan failed to score for the former, and scored only one goal for the latter. Konan is currently playing for Akwa United FC and will be hoping to find back his scoring boots. * Striker Ubong Ekpai of Akwa United FC has scored two goals in three matches, both being matchwinning goals against top clubs Dolphins FC and Kano Pillars FC. Ekpai, who trained with the Nigeria B national football team in 2011, scored three goals during the Nigeria Premier League 2012. * Akwa United FC has lost both their top goalkeepers from last season. Olufemi Thomas is currently warming the bench at Enyimba FC while John Dosu has already made his debut for Warri Wolves FC. Talented youngster Femi Kayode was between the sticks in the first match of the season, against Dolphins FC on 10.03.2013. Kayode, who played for second level side Akwa Starlets FC last season, kept a clean sheet in his top level debut. * Unfortunately, it is extremely difficult to find information about the players of El-Kanemi Warriors FC, based in the north-eastern town of Maiduguri. I have a theory that the club has signed the promising Hassan Hissein (born 20.05.1992), a full international player for the Republic of Chad, but this is currently unconfirmed. Further, I believe the club has signed Musa Musa, the experienced right-back or defensive midfielder, formerly of Kano Pillars FC. * Arguably, Michael Okoyoh of Enyimba FC is one of the hottest players in the Nigeria Professional Football League. 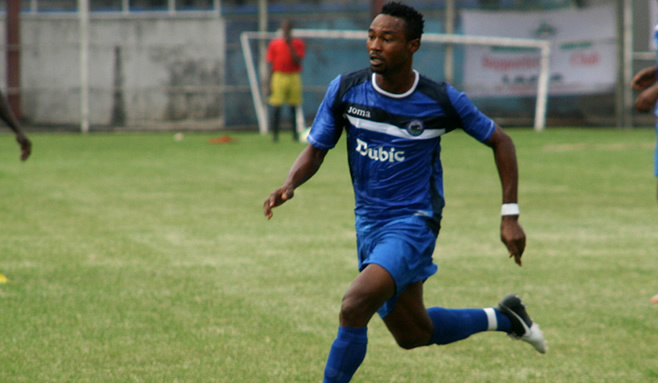 After several seasons at Warri Wolves FC, Okoyoh joined Enyimba FC before the current season. Okoyoh is primarily an attacking midfielde who loves to play just behind the strikers. So far this season, Okoyoh has been dictating the flow of the attacking play of his new club and has impressed with his excellent ball control. On 24.03.2013, Okoyoh scored his first goal for Enyimba FC in the 2-0 win over El-Kanemi Warriors FC. The picture, found on www.enyimbafc.net, shows Okoyoh in action. * Last season, Mustapha Babadidi and Sanusi Sani scored a total of 20 goals for Gombe United FC. Babadidi is currently injured while Sani has joined Rangers International FC. To replace the top strikers, Gombe United FC has signed two players from Wikki Tourists FC; Bishop Onyeudo and Wale Amusan (born 12.06.1989). On 24.03.2013, Onyeudo scored two goals against Sunshine Stars FC. Onyeudo is a former player of Rangers International FC and Enyimba FC. Amusan is primarily known for his performances from Slovenian football and the club FC Koper. Another interesting newcomer at the Desert Scorpions is Sarki Audu who scored one goal for Lobi Stars FC last season. Onyeudo, Amusan and Audu have the pleasure of playing alongside Austin Ekpoma (born 01.08.1991), one of the top attacking midfielders in the league. I thought Ekpoma had joined Warri Wolves FC before the season but he has definitely not. * Last season, Isah Akor starred for second level side Prime FC. On 24.03.2013, the powerful striker scored his first two league goals for new club Heartland FC. * Earlier today, Victor Namo (born 03.11.1988) scored his first two goals for new club Nasarawa United FC. From my point of view, the Solid Miners made a scoop when they signed the centre forward, formerly of Kano Pillars FC. Namo and goalkeeper Dami Paul (born 18.12.1992), formerly of the Nigeria U-20 national football team, will be key players for the newly promoted side. * Sunshine Stars FC has signed Ibukun Ojo, a striker who last season starred for second-level side Gateway FC. In 2011, Ojo was training with the Nigeria U-20 national football team. * Striker Ifeanyi Onuigbo (born 22.11.1989) returns to Nigerian football after a stint in Sudan with Hilal Omdurman, in Libya with Al-Ahli Benghazi and Darnes, and in Vietnam with Ha Noi T&T.